Hoseah Partsch is to be a clothing brand ambassador. Dandenong High School student Hoseah Partsch has landed a modelling gig. 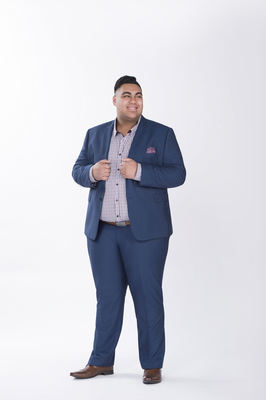 The 18-year-old is about to head out on tour with Boy George and Culture Club after finishing in second place on this year’s season of television singing contest The Voice. As if that wasn’t enough, menswear brand Johnny Bigg has announced him as an ambassador for its spring/summer campaign and unveiled a series of images from a photo shoot with The Voice winner Judah Kelly. Hoseah wowed the coaches and the public with his soulful performances on the show. “I’m just a normal kid from Melbourne trying to chase his dream and make a better future for his family,” he said. Should Greater Dandenong Council fine residents who don’t keep their nature strips neat? Councillor Sean O’Reilly asked the question at the Monday 23 October council meeting. City planning, design and amenity director Jody Bosman confirmed there was no policy about maintaining nature strips. “If the number of people that don’t mow is substantial, would the council consider passing local laws that would fine lazy and untidy residents that don’t mow their lawn?” Cr O’Reilly asked. Let us know what you think at the new Dandenong Star Journal Facebook page. Greater Dandenong Council has refuted claims that elderly residents are waiting 18 months for gutter cleaning. Councillor Maria Sampey told the Monday 9 October council meeting that “probably at the end of the 18 months they’re in nursing home”. But community services director Martin Fidler said the current wait time was actually about six weeks. Greater Dandenong councillor Sean O’Reilly asked the tongue-in-cheek question regarding a Domestic Animal Management Plan report proposing a cat curfew. City planning, design and amenity director Jody Bosman explained that most cats didn’t wander too far from home and were used to regular feeding times. The curfew suggestion followed a 342 per cent increase in complaints about cat trespass from 2013 to 2016. Officers will research options and bring the issue back to councillors for a vote.